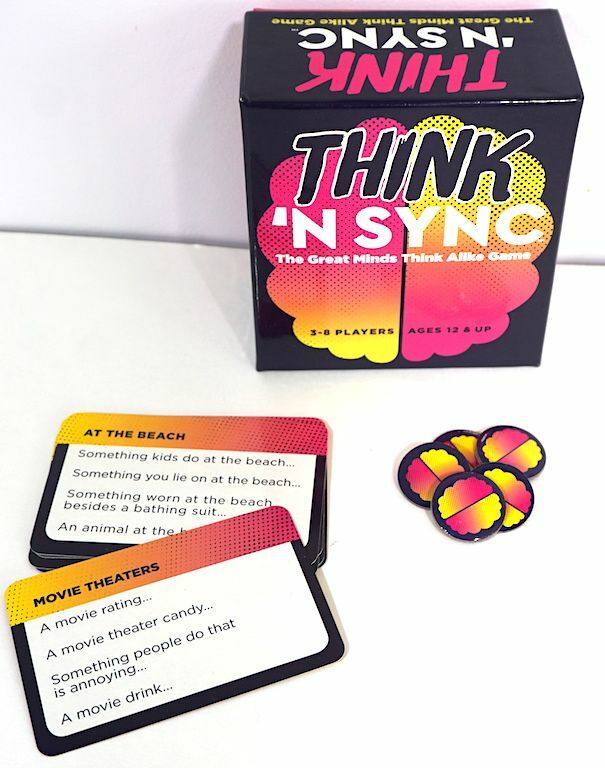 Think ‘N Sync, a party game from Gamewright, is a great icebreaker game for a group. Can you and your teammate think in sync? The goal is to “sync up” answers with your teammate. Plays round-robin style, so teams are fluid: you’re always cooperating with one of your neighbors. Really convenient when you have an odd number of players. Three people participate in each round: A reader and two guessers. 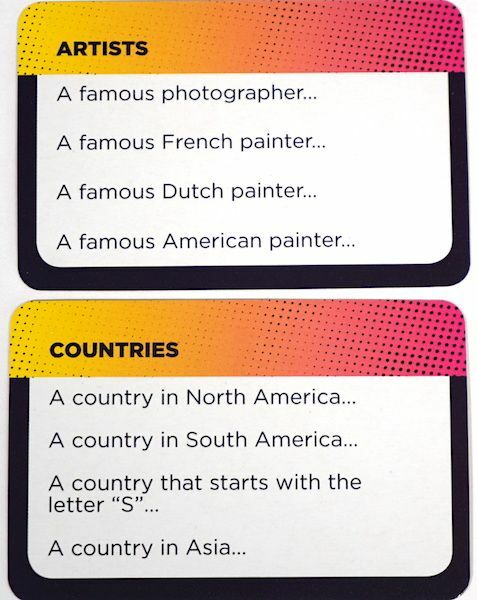 Reader reads the category at the top of the card, then reads the sub-category. On the count of three, both guessers shout out their answer. If both players agree, they both earn a token. Whether or not they agree, play continues through the four sub-categories on the card, then the next team is formed. Keeps people involved, in an asymmetrical sort of way. Since you’re not always teamed with the same person, it keeps you on your toes. When we played, tracking points felt a little fiddly and we ended up just playing this as a fun activity; but we find that happens a lot with our group and party games. Think ‘N Sync feels a bit like Family Feud – you aren’t trying to guess the “right” answer, you’re trying to guess the same answer as someone else. Classic Gamewright party game: small box, low price point, easy to dive in and play. Find Think ‘N Sync at Amazon, or wherever Gamewright games are sold. The Family Gamers received a review copy of Think ‘N Sync from GameWright Games. Decidedly average. Fine game, just not a hit for us.